The opening credits are short (and skippable). Both the Demo and the Vs Play were located under the Multiplayer menu. Download time was less than a minute for either activity. Wordjong is extremely easy and logical in its approach and interface, keeping nex players in mind. The menu options are all displayed on large, wide bars, making them easy to tap. While not overly large, there are sufficient buffer spaces in between the bars. WordJong is another game that strictly uses the "tapping" control scheme. Anyone familiar with any MahJong game, however, can tell you that's the best possible control scheme. Simply tap the tiles you want pulled (in the order you want them pulled) and you're all set. Sensitivity is excellent, but can (on a rare occasion) mistake a light brush as you move the stylus across the screen as a tap, which you'll have to back up and undo (minor issue). While graphics aren't incredibly important in a letter-tile puzzle game, the fine details were taken into account nicely, right down to the tiles having a thickness and some beautiful backgrounds. While the music isn't much (good or bad), the sound effects are nice. The pitch even changes depending on where in the word a tile is (first, second, third, etc.) when it's placed. Another pleasant surprise is the ability to change (or remove) per-turn time limits and whether Drill Down is in use for the Vs Play (especially considering that the manual implies the option isn't available). WordJong is a game that builds on a premise that's familiar to a lot of people: MahJong. There are two important differences that make WordJong unique. One of those changes is to take the symbols on the tiles and replace them with letters. The second change is to form words instead of matching like tiles. Any fan of word games will love WordJong. 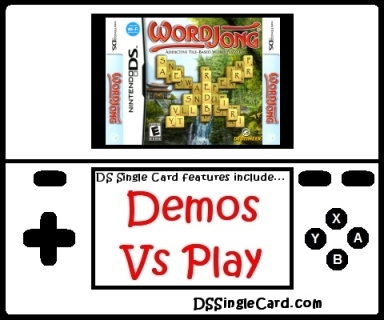 With a variety of puzzle shapes and power-ups, the game stays fresh for a long time (I played it a lot); the Single-Card Download Demo including a random puzzle generator. Overall the game is fun and even has the side effect of enhancing vocabulary. Some people might say forming words (from two letters to eight letters in length) makes the puzzle end sooner. I just say that it allows you to fit in more games. The truth is that WordJong is extremely addictive to anyone who even remotely likes this type of game. I know I'll be playing this one again! Slightly decrease sensitivity so as to avoid accidental taps. Assign numbers to puzzles in some modes so that specific puzzles can be gifted (as a demo). Offer a difficulty setting option that can increase (or decrease) the number of tiles. Click here to return to the DSSingleCard.com WordJong profile.